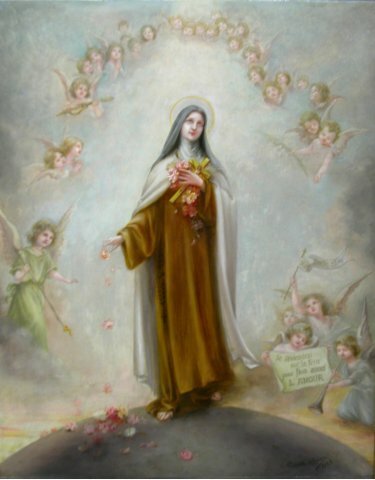 The Canonization Process of St. Thérèse of Lisieux: Thèrése became a saint because of the way she responded wholeheartedly to God's love and the grace of the Holy Spirit within her. We believe that God embraced her upon her death and shared with her the risen life of Jesus in Heaven. While the Church recognizes the holiness and sanctity of many good people, official canonization is a long process. The Roman Catholic Church seeks definite signs before officially declaring someone a saint. In the case of St. Thérèse, the process went swiftly. In the popular piety of the people, she became a saint in their hearts even before the official declaration introducing the cause for her canonization. This official declaration was introduced on June 10, 1914, by Pope Pius X. 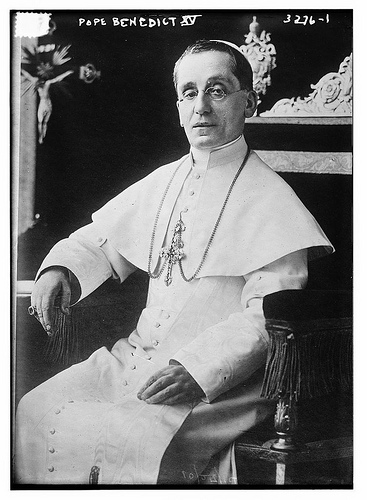 The next step, being declared "Venerable" occurs when evidence is found of extraordinary holiness and inspiration; this happened for Thèrése on August 14, 1921, when Benedict XV made the declaration. In order to move to the next step, "Beatification," two certified miracles are needed--both of which must be attributed to the intercession of that person with God in Heaven. Miracles must involve situations where there is no other natural explanation. They are evidence of supernatural intervention, through intercessionary help. Shortly after Pope Pius X had signed the decree for the introduction of St. Thèrése's cause, a priest said to him that there was nothing extraordinary in the life of Thèrése. The Pontiff replied: "What is most extraordinary about this soul is precisely her extreme simplicity. Consult your theology." This theological truth, that sanctity lies in simplicity, is the teaching most needed in our time. 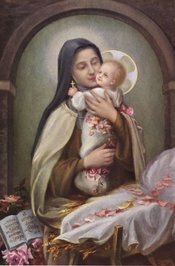 It was the littleness of St. Thèrése, that is to say, her utter dependence on God, her complete dependence as a little child, and with it the confidence which only a little child can possess, with which God fashioned His Saint. It is upon these foundations alone that God can build true greatness. September 1910--Prior to Opening Her Cause for Canonization: During her last illness, Sister Thèrése of the Child Jesus had often asserted her desire that, after her death, nothing of her would be found if her body was exhumed, save her bones. "You have loved God too much for that to happen," said a novice to her shortly before her death. "He will work a miracle for you, and we shall find your body incorrupt." "Oh, no!" answered Thèrése, "That miracle would be to stray away from my little path of humility, and little souls must not find anything in me to be envied." On September 6, 1910, the remains of St. Thèrése were exhumed to make sure of their being preserved, but without any intention of exposing them to the veneration of the faithful. Efforts had been made to keep the matter secret; but in spite of the precaution, it became known, and hundreds made their way to the cemetery. The work of taking up the remains presented great difficulties, as the coffin lay at a depth of over eleven feet, and was in a very bad state of decay. The operations were directed by an expert in this kind of work. He had boards slipped under the coffin, the bottom of which threatened to give way. Both coffin and boards were surrounded with strong canvas and lashed together with stout leather straps. After much delay and anxiety, the men succeeded in bringing up the coffin without any mishap. When it came into sight, the Bishop intoned David's Canticle in praise of the Lord, "Who raise s up the lowly from the dust...that He may place him with the princes of His people?" (Ps. 7:8). 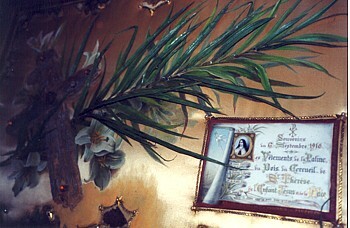 Through the loose boards was seen, fresh and green as ever, the palm which had been laid upon the remains of Thèrése on October 4, 1897. Perhaps a symbol of the immortal palm she had won by her martyrdom of self—that martyrdom of which she had written: "I desire at all costs to win the Palm of Agnes; if not by the shedding of blood, then by Love." The coffin was then opened. Two workmen, a father and son—one of them the carpenter who had made it—were standing close by as this was done, and they noticed a strong scent of violets, for which there was no natural explanation, and it made a deep impression upon them. At first her garments appeared to have been preserved, but on closer inspection, it was seen that both the veils and the wimple had completely disintegrated; moreover, the coarse thick material of the Carmelite dress had become quite flimsy and could easily be torn. Finally, as the humble nun had desired, nothing was found of her except her bones. One of the doctors wished to present Msgr. Lemonnier with a fragment of the latter, but he forbid any of the remains to be taken away, and would accept only the little cross that had been placed in the hands of Thèrése. The old coffin was then laid in a shell of lead, and this within another of oak. A new robe was placed on the sacred remains, while the skull was covered with a veil and surrounded with roses. These had been gathered from the very rose trees whose blooms the saintly Thèrése had so often cast at the foot of the cross on the convent grounds. Afterwards, the coffin was placed upon a trestle in front of the entrance to the graveyard. For forty-five minutes, there was a constant succession of people bringing pious objects to touch to the sacred remains. The Bishop of Bayeux had been the first to touch a cloth to her bones. Workmen, who had nothing else available, were seen to touch their wedding rings to the remains. It is estimated that over five hundred people paid their respects after having waited three hours. The hearts of those present felt an increase of fervor and devotion. The oak coffin was then sealed shut and placed in a new grave which had been dug a short distance from the first and lined with bricks. That evening the boards from the first coffin, along with a few bits of the clothing and the palm, were all taken to the convent. The Sister who had been sent to gather them together was on two distinct occasions favored with a scent of roses. At other times, pieces of clothing and of the coffin emitted a fragrance of incense. A few weeks later a certain University Professor heard of the result of the disinterment. A man of great intellect and sanctity, he had received all manner of graces from St. Thèrése since he came to know of her more than ten years before. He was grieved at first that the Saint had been made subject to the law of nature, and as he dwelt upon these gloomy thoughts, he heard a voice within him say, “It was the robe of my working days I laid aside. I await the robe of the Eternal Sunday; I am little concerned as to what happens to the other.” “And then,” added the Professor, “an interior light consoled me, and I understood that by means of this dissolution the very atoms of her body would be scattered throughout the world, so that not only her soul but also her body might be present and do good upon earth. Indeed, it seems to me that everything which has really belonged to the body of a saint is sacred, and if this be so, not only the bones but also the invisible molecules of matter may possess and carry afar the grace that accompanies relics." On August 14, 1921, Pope Benedict XV, declared that Thérèse had lived a life of heroic virtue, the declaration which gave her the title, "Venerable." 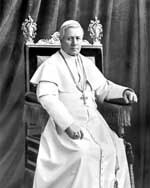 After Pope Benedict died early in 1922, Pope Pius XI continued her cause. Beatification: In 1923 the Church approved of two spontaneous cures unexplained by medical treatment. After praying to St. Thèrése, Sister Louise of St. Germain was cured of the stomach ulcers she suffered with from 1913 to 1916. During the night of September 10, 1916, St. Therese appeared to Sr. Louise and said: "Be generous, you will recover soon, I promise you". However, in the morning, several nuns found rose petals of all colors strewn around the bed of the patient. A few days later, on September 22, Sister awoke fully healed. Supporting the treating doctor's certificate are a conclusive X-ray and two reports--one from the eminent Dr. Bec, a Surgeon at St. Joseph Hospital in Paris, and another one from Dr. Victor Pauchet, a highly recognized doctor—confirming the supernatural nature of this sudden and sustainable transformation. The second cure involved Charles Anne, a 23-year-old seminarian who was dying from advanced pulmonary tuberculosis. The night he thought he was dying, Charles prayed to Thérèse. Afterward, the examining doctor testified, "The destroyed and ravaged lungs have been replaced by new lungs, carrying out their normal functions and about to revive the entire organism. A slight emaciation persists, which will disappear within a few days under a regularly assimilated diet." The cures having been declared "miraculous," on April 29, 1923, she was Beatified by Pope Pius XI in St. Peter's Basilica--which declared her "Blessed Thèrése of Lisieux". 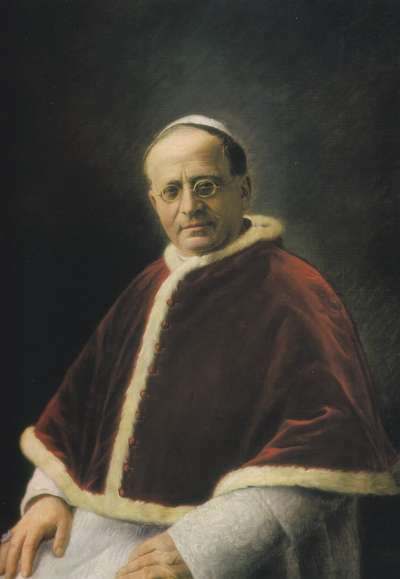 Canonization: The outpouring from all over the world again spurred Pope Pius XI to dispense with canon law’s time frames. Once she was declared Blessed, it took only two years for the next two miracles to be approved. 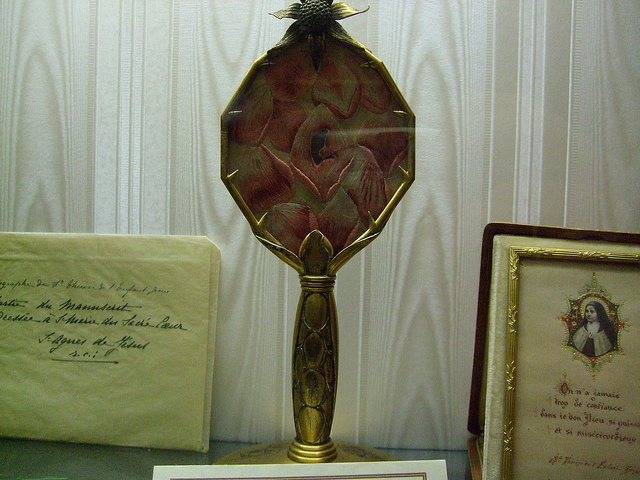 In 1925, two cures had been investigated and judged to be supernatural, through the intercession of St. Thérèse. The first involved Sr. Gabrielle Trimusi from Parma, Italy. Sr. Gabrielle who, at the age of twenty-three had entered the Convent of the Poor Daughters of the Sacred Heart in Parma, Italy, began in 1913 to suffer from pain in her left knee. She was in the habit of breaking the firewood across her knee, and this caused a lesion at the joint which prepared the way for a tuberculous infection. The trouble began with a dull pain, then the knee became swollen, and finally loss of appetite brought about emaciation. She was attended by two physicians, but without success, so that three years later she was sent to Milan, where injections, sunbaths, and various other forms of treatment were tried in vain; at the end of four years the spine itself became affected. The invalid returned to Parma, where several doctors diagnosed it as a case of tuberculous lesion, and prescribed general remedies. A radiograph of the knee revealed at this period the existence of periostitis at the head of the tibia. Taken to the hospital, she was once more subjected to X-rays, but while there was attacked by Spanish influenza, and began to suffer fresh and constantly increasing pain in the vertebral column. All remedies proving ineffective, she was recommended by a priest on June 13, 1923, to join in a public novena in honor of Blessed Thérèse. She joined in the prayers, more concerned, however, over the health of the other nuns than her own. The close of the novena coincided with the close of a triduum in a neighboring Carmel, and several of the nuns--Gabriella among the rest-- sought permission to attend the ceremony. On her return, after slowly and painfully effecting the short journey, she entered the chapel of the Community, where the others were already assembled. The Superioress exhorted her to pray with confidence, and bade her go to her place. Strange to say, the invalid knelt down unconsciously on her knee without feeling the slightest pain, nor did she realize what she had done, on account of the increase of suffering at the moment in the spine. She next went to the refectory with the others, and, the meal finished, slowly mounted the stairs. Going into the first room that she saw, she took off the apparatus she wore to support the spine, and cried out loudly: "I am cured, I am cured!" Sister Gabriella Trimusi returned at once to her labors and the exercises of religious life, without either pain or fatigue. The doctors appointed by the Sacred Congregation discussed the miracle at great length, and decided that the lesion at the knee was chronic arthrosynovitis and the spinal trouble was chronic spondulitis. These two lesions, rebellious to all other treatment, yielded to God's power, and Sister Gabriella, by a miracle, recovered her health permanently. The final cure involved Maria Pellemans of Schaerbeck, Belgium. In October 1919, Maria Pellemans was a victim of pulmonary tuberculosis which had spread, as Thérèse's illness had, to her intestines. This was followed by gastritis and enteritis, both of them likewise of a tuberculous nature. She was medically attended at home, then in a sanitorium. In August 1920, she went to Lourdes, but all to no purpose. In March, 1923, she accompanied a small band of pilgrims to Lisieux, and while kneeling at the tomb of the Blessed Thérèse she was suddenly restored to perfect health. The original diagnosis of pulmonary and intestinal tuberculosis was made by a Dr. Vandensteen, who also examined Maria after she came back from visiting Thérèse's grave. The doctor testified, "I found Miss Pellemans literally transformed. This young woman, previously out of breath from the least movement, now moves about without fatigue; she eats everything given to her, with a very good appetite. The abdomen presents no tender point, when formerly the least pressure produced severe pain. All symptoms of tubercular ulceration of the intestine have disappeared." In reports predating Maria's return to health, two other physicians confirmed Dr. Vandensteen's diagnosis of pulmonary and intestinal tuberculosis. On May 17, 1925, just over two years after her beatification, Thérèse was officially declared a Saint by Pope Pius XI, while her four sister nuns were still living. The scene in St. Peter's was said to be almost impossible to describe; the gathering was the largest and most distinguished for centuries. Thirty-four cardinals were present, and over two hundred bishops and innumerable representatives from religious orders and missionary societies. Bishop Michael James Gallagher, D.D., (Bishop of Detroit,1918-1937), who was present at the canonization, wrote: "I never witnessed such a magnificent spectacle as when the Holy Father, surrounded by hundreds of bishops and dignitaries, hundreds of guards in brilliant medieval uniforms, and a vast concourse of 80,000 people, solemnly declared the humble nun a saint of God. The scene at the Consecration of the Mass was sublime beyond description. In Jerusalem of old, at the sound of a trumpet, 100,000 Israelites in the streets or on the roofs of their houses, all turned toward the temple and fell on their knees. That scene was dwarfed by the grand spectacle in St. Peter’s. Thousands of soldiers who stood till then, fell on their knees, and a hush came over the vast throng, and then Christ descended on the altar, which became another Bethlehem, while high up in the dome a trumpet sounded and thousands outside joined with those in the basilica in an act of adoration. No court in the world could ever evoke such splendor and enthusiasm." 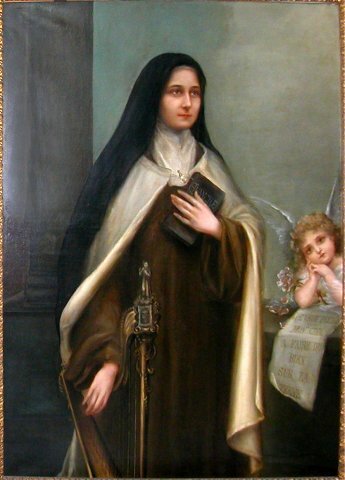 Other notable titles given to St. Therese: On December 14, 1927, Pope Pius XI declared her the Universal Patron of the Missions. On October 19, 1997, just over one hundred years after her death, Pope John Paul II declared her a Doctor of the Church, only the third female saint to receive that title. (For the homily Pope John Paul gave, go to: http://www.catholicculture.org/culture/library/view.cfm?recnum=233).